Jean-Bertrand Aristide has been living in South Africa since he fled Haiti during a violent uprising in 2004. Port-Au-Prince, Haiti (CNN) -- On the heels of an exiled despot's arrival in Port-au-Prince, former Haitian President Jean-Bertrand Aristide says he is ready to return to help his troubled homeland, an idea welcomed by some and reviled by others who fear a deepening crisis. "As far as I am concerned, I am ready," Aristide said in a statement from South Africa, where he has been living since he left Haiti during a violent 2004 uprising. "Once again I express my readiness to leave today, tomorrow, at any time," Aristide said. "Since my forced arrival in the Mother Continent six and a half years ago, the people of Haiti have never stopped calling for my return to Haiti." Aristide's lawyer in the United States said that the former president does not have a passport, and the Haitian government will not issue him one. "If he were free to leave and had a passport, he'd be on a plane tomorrow," said Ira Kurzban. Kurzban told CNN that no talks have taken place that would allow Aristide to return to the nation that elected him president. "For Aristide to leave, he would need the cooperation of the U.S. government and the South African government," he added. South Africa's Ministry of Foreign Affairs declined to comment and the United States did not express any enthusiasm. "We do not doubt President Aristide's desire to help the people of Haiti. But today Haiti needs to focus on its future, not its past," State Department spokesman P.J. Crowley said via Twitter. "This is an important period for Haiti. What it needs is calm, not divisive actions that distract from the task of forming a new government." Nor was Washington bubbly about Duvalier. Susan Rice, the U.S. ambassador to the United Nations, said America is concerned about the impact of Duvalier's presence in Haiti. "My government is clear about Duvalier's notorious record of human rights abuses and corruption," Rice said at a Security Council briefing. "The situation on the ground is obviously fluid, but the government of Haiti seems to be taking initial steps to hold Duvalier accountable for his actions during his time ruling Haiti. " Some Haitians were dismayed that a despot was issued a diplomatic passport to travel back home but an elected leader was not afforded the same right. "It's appalling," said Jacob Francois, coordinator for Aristide's Fanmi Lavalas party in the United States. Carel Blain, an artist in Port-au-Prince, said he supports the right of all Haitian citizens to be able return home. "Duvalier came back, so Aristide should come back, too," Blain said. Mark Weisbrot, co-director of the Center for Economic and Policy Research, said it is "completely outrageous" that Aristide is barred from traveling. "It's not a legitimate question -- whether he should be allowed or not," said Weisbrot, whose Washington-based group monitors Haitian politics. "He is a citizen of Haiti, a former president. He has the right under international law. You can't have a more blatant anti-democratic statement than this." Weisbrot accused the United States of working for seven years to guarantee Aristide's absence from Haiti. He cited U.S. diplomatic cables obtained by the website WikiLeaks and published in the Brazilian newspaper Folha in which former Secretary of State Condoleezza Rice impresses upon Brazil the need to keep Aristide out of Haiti and prevent him from exercising any political influence. Brazil is in charge of United Nations peacekeeping forces in Haiti. The former Roman Catholic priest undeniably remains a controversial figure in the Caribbean nation, though he still has a following. Regarded as a voice for the poor, he irked the United States with his promotion of liberation theology. He grew to become the father of Haitian democracy but faced accusations of widespread corruption and despotism in his last years. A bloody revolt by street gangs and soldiers forced him to flee in 2004. Aristide says he was forced out by Western powers. He has repeatedly said over the years that he wants to return home. His latest statement, however, comes at a pivotal moment as Haiti is embroiled in political turmoil. A late-November presidential election resulted in allegations of widespread fraud and final results have yet to be determined, even though current President Rene Preval's term is set to end in early February. The nation also is struggling to recover from last year's massive earthquake and a cholera outbreak that has killed almost 4,000 people. The U.S. State Department issued a new warning Thursday for Americans to avoid travel to Haiti. "The number of victims of violent crime, including murder and kidnapping, continues to increase in Port-au-Prince," the warning said. "Some kidnapping victims have been physically abused, sexually assaulted, shot, and even killed. No one is safe from kidnapping, regardless of occupation, nationality, race, gender, or age." The return of Duvalier, whose ouster in 1986 gave way to the rise of Aristide, complicates matters further. It's not clear whether Duvalier harbors ambitions of holding Haiti's highest office again. Duvalier's lawyer, Reynold Georges, said the former strongman does not intend to quit Haiti, even though he faces charges of financial wrongdoing and possibly human rights abuses. Georges told CNN that Duvalier would fight any charges against him and could very well get back into politics. "You can bet your life on it," Georges said, referring to Duvalier's intention to remain in Haiti, adding that Duvalier is looking into renovating one of his old homes. His longtime companion Veronique Roy denied Thursday rumors that Duvalier is sick and had returned home to die. She and Duvalier checked out of the swanky Karibe Hotel where they had been staying since their return Sunday. Their destination was unknown but many presume they were heading to more permanent housing. Aristide's intentions are also unclear, though he said in his statement that he wants to go back home to serve Haitians "as a simple citizen in the field of education." "The return is indispensable, too, for medical reasons," he added, saying he has had six eye surgeries in the six years he has lived in South Africa. "The surgeons are excellent and very well skilled, but the unbearable pain experienced in the winter must be avoided in order to reduce any risk of further complications and blindness," he said. "He does not want to be involved in politics," said his attorney, Kurzban. Francois, his political coordinator in the United States, said it is irrelevant whether Aristide returned as president. 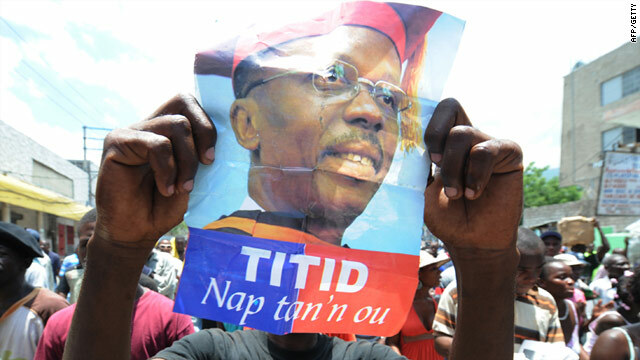 What matters, he said, is that Aristide is the only man who has the power of words to inspire others, who has the mettle to lead Haiti out of its latest crisis. CNN's Moni Basu, Kim Segal, Rich Phillips, John Zarrella and Whitney Hurst contributed to this report.